A critical mass of New York celebrities and food luminaries is opposing fracking in the city’s watershed. Mario Batali and Edible hero Bill Telepan recently authored a persuasive op-ed asking the governor to “serve food, not fracking” in a May 30 opinion piece in the Daily News. Gasland 2 will headline the docs category at the Hamptons International Film Festival with renewable energy fan Alec Baldwin moderating the discussion. And, earlier this month, at an event hosted by ABC Kitchen and Home with Deepak Chopra, a new coalition of food and drink businesses was formed to push elected officials to ban fracking in the state. If you haven’t been privy to the discussion about hydrofracking in New York, you might be living under a rock. It’s as troubling as any environment and food issue going in the Empire State. This room was filled with prominent business owners– among art, agriculture, business and activism, including the head of the American Sustinable Business Council and founder of Aveda–united by the idea that endangering our water supply, even if the risks remain uncertain, could raise costs for everyone, and hurt the city and state in other ways: reduced tourism, unprecedented water cleaning costs, pollution of precious farm and pastureland. 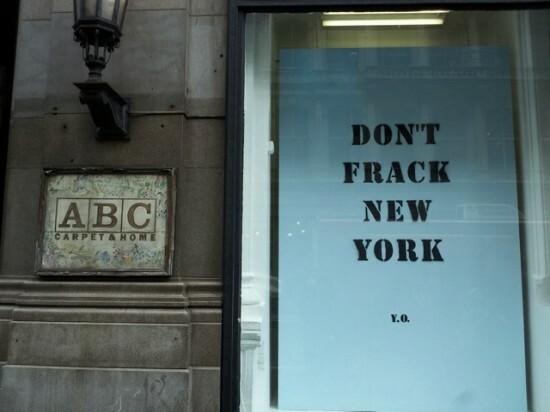 More than 1,000 businesses have spoken out against fracking New York to date; earlier this week, Chefs for the Marcellus and Food & Water Watch organized the New York Crossroads Rally & March: No to Fracking/Yes to Renewables. Speaking on behalf of the antifracking majority in New York state, the panel featured economist Jannette Barth, who cited evidence that fracking’s “boom-bust” job benefits have proven to be short term, and that recent studies indicate that New York could be self-sufficient in renewables by 2030. Filmmaker Josh Fox of Gasland and Gasland 2 told tragic tales of families whose farms, health and lives were ruined by fracking. Alex Matthiessen, Hudson Riverkeeper and the executive director of the Riverkeeper organization, admitted that while he had once been a supporter of natural gas as a “bridge fuel” away from other fossil fuels, he now knew that was “a farce” and natural gas was just as dirty in many ways. Food and drinkmakers have quickly moved to the center of this debate. Several years ago, a coalition of thousands of New York City chefs and restaurant workers banded together under the “Chefs for the Marcellus” campaign, arguing to the governor that regardless of the short term benefits, fracking will endanger the market for Empire State produce in New York City and beyond. The Park Slope Food Co-op, which has 100,000 members, has organized a letter writing campaign noting that it will stop buying from organic farms in the region. And yet we have still not banned fracking on some of our best farmland in New York, smack dab in the middle of the watershed that provides drinking water for nearly 15 million New Yorkers. In our correspondences with Edible publishers around the nation, we were surprised and further troubled by hearing that hydrofracking developers are eying good farmland and watersheds nationwide—from Marin County, Calif., to the Mississippi River basin in Iowa. New York, it seems, is not alone. All the more reason for New York to lead the way and show to the nation that we value our food and water more than short-term energy needs. Learn more and take action at Chefs for the Marcellus and Food & Water Watch.